Having lived in many countries — Denmark, Nigeria, France, England, the U.S. and Belize — Sonia Marsh considers herself a citizen of the world. She prides herself on being a gutsy woman who can pack her carry-on and move to another continent in one day. As a motivational speaker, Sonia inspires audiences to get out of their comfort zone, take a risk and pursue their dreams. As a book marketing coach for indie authors, she guides her clients to indie success. Sonia welcomes new friends, bloggers, writers and readers at Soniamarsh.com (http://soniamarsh.com). Contact her at: sonia@soniamarsh.com, www.facebook.com/GutsyLiving or Twitter.com @GutsyLiving. If you’re an indie author, she invites you to join her Gutsy Indie Publishers Facebook group. There, you’ll find tips from a wide range of writers on publishing and marketing your books. Sonia’s current home base is in Southern California. Stay tuned as she plans her next gutsy adventure with the Peace Corps, where she hopes to serve helping women and children in Africa, the Western Caribbean or Vanuatu in the South Pacific. Stay in touch with her on her blog: SoniaMarsh.com, where you can read about her new adventures and the start of a new life in 2015. 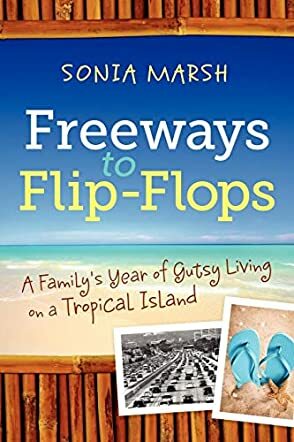 Freeways to Flip Flops: A Family’s Year of Gutsy Living on A Tropical Island written by author Sonia Marsh is the true tale of her family’s adventure. Duke Marsh was a very successful lawyer in Orange County, CA. He, his wife Sonia, and their three sons, Steve, Alec and Josh were living the American dream. They had a 3500 square ft. home in a very nice neighborhood and were financially secure. However, their son Steve was rebelling. Duke and Sonia were very concerned for their oldest son and perhaps they craved the adventure of something out of the ordinary. For whatever reason, they sold their home and packed up the kids and the dog and moved to the paradise of Belize. Duke adjusted to the laid back culture faster than the rest of the family. At times, Sonia worried that he had adjusted too fast. They saw a change in Steve; he became more responsible and focused. They also saw a change in Alex; he tried to adapt but it was not easy. They had sacrificed the well-being of one son to save the other. There is so much more to Freeways to Flip Flops than I can share in this review. I found their adventure to be fascinating. Author Sonia Marsh’s writing style was conversational. I felt as if we were sharing a cup of coffee as she told me about their year in Belize. Her words are very descriptive. This tale is humorous at times and a little frightening too. I would also consider this tale a love story for it is obvious that Sonia and Duke love each other and their children. Freeways to Flip Flops is a fascinating look at the life of one family when they give up the materialistic rat race and move to a hut in what they believe will be paradise.